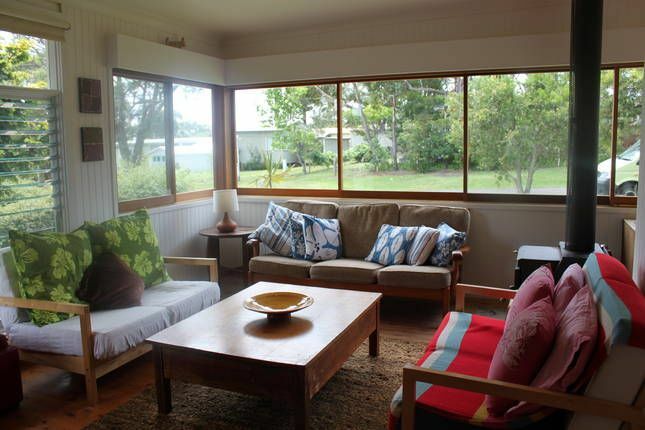 Jacaranda is a 1960's original beach house which has been stylishly renovated. It has an easy laid back feel and layout. Great for relaxing with friends and family. The house has 4 bedrooms - 2 queen, 5 singles. One of the bedrooms is a seperate outdoor sleepout. 2 bathrooms - one with bath. The south coast is abundant with wildlife. In Bendalong kangaroos laze in our backyard, dolphins leap over waves and birds sing out. We are surrounded by pristine beaches and National Park. Enjoy swimming, surfing, fishing, boating, walking, lazing in the sun, reading a book, cooking up a feast. Visit well renowned surfing spot Green Island, the historic own of Milton, Lake Conjola or climb Pigeon House Mountain. Bendalong is an easy 3 hour drive south of Sydney and a 2.5 hour drive north-west from Canberra. Milton & Mollymook are 20mins south towards Ulladulla. Our house is centrally located in the town, allowing easy access to several surf beaches or quiet family friendly beaches. 1 minute walk away there is a well stocked General Store selling food & liquor. We like to make bookings from Sat to Sat. A $300 security deposit is required with all bookings and is refundable after inspection of property. We have a strict maximum 8 people however we are happy to accomodate additional young children. Pets are negotiable with additional payment of $200 bond. Note* Linen is an additional cost of $20pp. We welcome you to provide your own linen & towels or request to pay the additional cost. Lover of nature and the earth. Right in the heart of nature - the beautiful blue ocean and the bush. The house is in a central location. Really spacious accommodation, cosy wood fire and comfortable furniture. Lots of interesting bits and pieces around the house. Great kitchen and lots of equipment to utilise. Back yard patio and garden very pleasant to sit in. Outdoor shower fantastic for us surfers to shower and wash down our gear. Location fantastic only a minute walk to general store. Beds very comfortable and cosy bed linen. Even though the weather was 4 seasons the house catered for us and our pups very well. We would highly recommend this house. Tnx Monica & Rex for your thoughtful review full of warmth & kind words. Our April stay at Jacaranda @ Bendalong was so great. It is such a relaxed house and very comfy. Jacky was very helpful and easy to deal with. The house had everything we needed. Great position in Bendalong. We'll recommend it to anyone and we'll be back. We had a mid-week stay at Jacaranda and had a great time. Jacardanda has a lovely relaxed vivbe and is a nicely set-up property, with lovely a back-yard and deck. Three mums and six kids (4 years and under) spent a lovely October long weekend away at jacaranda. The beach house was spacious and had a really laid back, relaxed feel to it. The kids absolutely loved the tree house. I loved this house! Perfect for our little getaway with friends and I can't wait to go back in summer. Great location. The house had everything we needed and was very comfortable. Very homey. great for families. Plenty of space. Thanks! We had a wonderful 3 nights as Jacaranda house in Bendalong. Great location with a lovely big backyard (not fenced though) for kids. The house was very clean, yet welcoming. The house had all the extra touches that make holiday stays just perfect - gas oven, good pots and pans, pegs, nice bathtub etc. Highly recommended.